The house is little quieter with only two little boys here (the big kids are away at Grandpa Camp for a week). 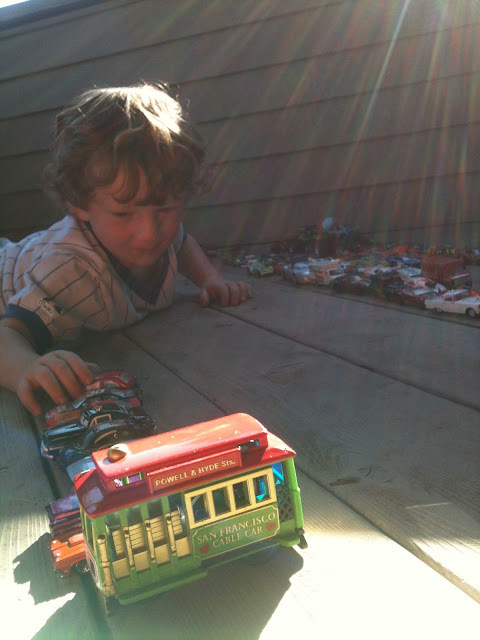 Baby Wade plays with his cars like normal and then all of a sudden looks up and says "Where's Buddy?" He asks like he just realized his big brother wasn't around, even though it's been days. Wade then goes back to the business of making another "set up" with his cars. He's very intense, then he'll look around and ask "Where's Lucy?" Again, like he just noticed she too wasn't around. These scenarios are repeated about 500 times a day. JT is taking full advantage of not competing with his older siblings for attention. Nature walks and baseball with dad. Lots of Wii. He seems to be living it up and loving it. My husband does indeed have an extra large head, but this picture is ridiculous. I promise, it's a big head, but it's not a scary giant head like this picture implies. But at night, they both get sad and insist on snuggling together on the floor of their room. They miss their big brother and big sister, and cannot fall asleep unless they are side by side. I feel sad too and miss my older babies. But I'm treasuring the time with my little ones.